F-16 Viper Update. 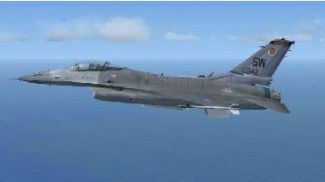 This is an update for FSX of the F-16 Viper by Kirk Olsson. This is just a texture to replace the decal3.bmp from the Viper in FSX. At least some versions of FSX like service pack 2 have a hole where the ejection seat warning is near the canope. This update is for you if you have such a hole in the aircraft. This is just a replacement texture that gets rid of the hole. By Bob Chicilo. Unzip to a folder of your choice. Copy the decal3.bmp to the texture folder and say OK to replacing the original texture. THIS IS ONLY FOR THOSE PEOPLE WHO HAVE A HOLE IN THE FUSULAGE NEAR THE BACK OF THE CANOPE. The archive vdecal3.zip has 6 files and directories contained within it.